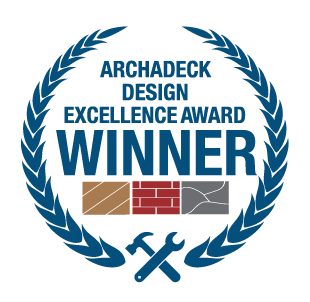 Archadeck of Nashville caters to all aspects of improving your time outdoors. Whether it is a custom deck to add valuable outdoor living space, or a porch to keep you cool and dry on those humid Middle Tennessee afternoons, our backyard structures are built with your comfort in mind. Nothing says comfort more than a gorgeous night by the fire, but who says that fire has to be indoors? 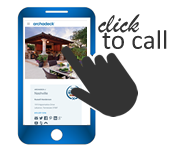 With the help of the experts at Archadeck of Nashville, you can get a custom outdoor fireplace or fire pit in your own backyard. Roast marshmallows, tell stories, or just snuggle up by the fire while you read a good book. The possibilities are endless, and the joy is guaranteed. Which fire feature is right for me? Choosing between a fire pit and fireplace is an important decision when designing an outdoor living environment. Both fire features extend the enjoyment of the space by providing warmth, light, relaxation and ambiance. However, they have important differences that should be considered. Along with the number of people you are trying to accommodate, and the function you want to achieve with your fire feature, the amount you wish to invest is also an important consideration when choosing an outdoor fire feature. 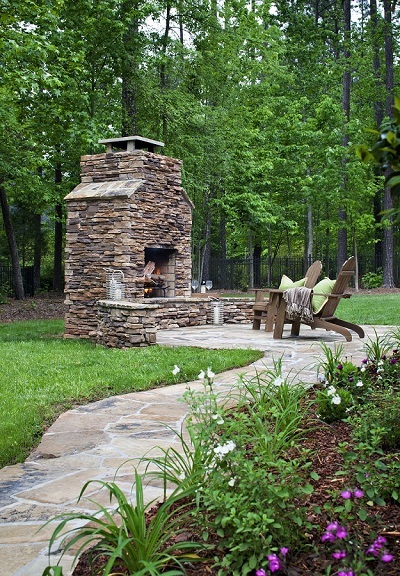 A Nashville custom outdoor fireplace truly makes a statement in the landscape or as part of an outdoor living combination space. Fireplaces serve as dominant design features even when not in use, however, they do take up more linear space than a fire pit because more design components are involved. In order to make the best decision to fit your spatial needs and lifestyle, it is important to be aware of the size demands of an outdoor fireplace. 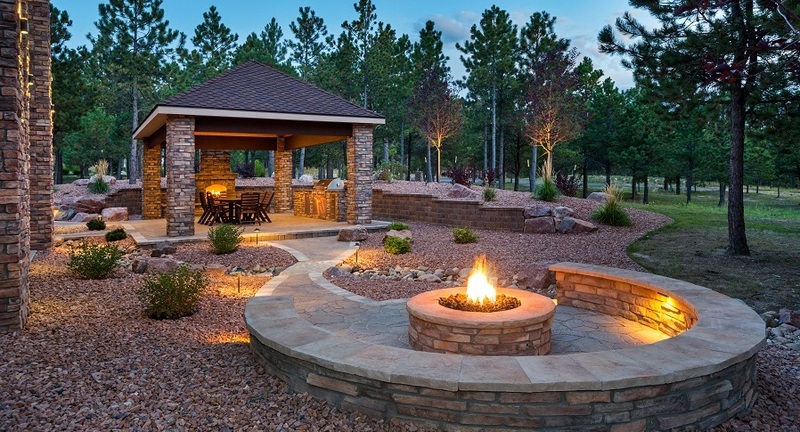 Adding a fire pit to your outdoor space is more economical than adding an outdoor fireplace. Depending on the materials, size and burning medium you choose for your fire pit (gas-burning pits are usually more expensive than wood-burning pits) your price tag could be half of that of an outdoor fireplace. This is a welcome thought for homeowners wishing to create backyard bliss on a budget. There are two different types of fireplaces and fire pits that most homeowners choose from: wood burning and gas. Both are available in a wide range of designs, styles, and shapes, and both can be customized to fit your needs. Classic wood burning fireplaces have a distinct charm that cannot be replicated by modern technology, but gas burning fireplaces are easier to maintain and can be just as beautiful to look at. Regardless of the fire feature you choose for your home, our team can install it with ease. 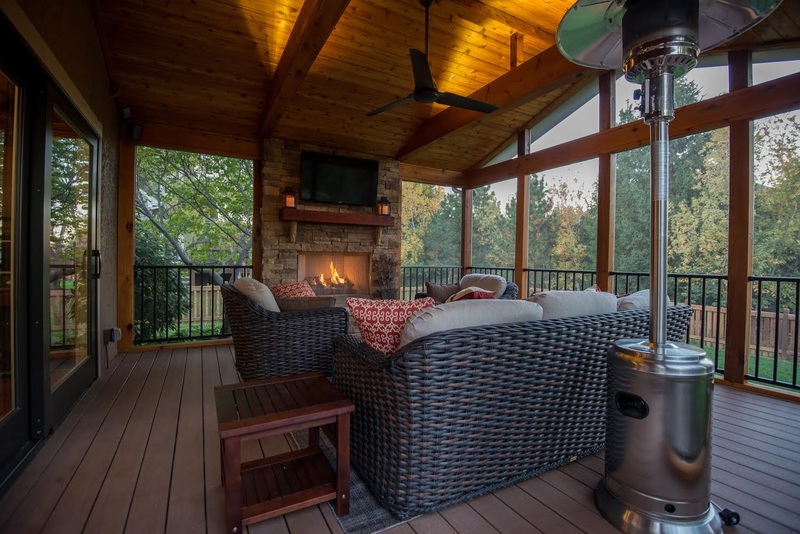 If you have an outdoor living room, patio, deck, screened porch, or any other outdoor living space, you can easily enhance the area with a fire feature. Our designers will work with your existing space to ensure that your new fireplace blends seamlessly with your hardscape or wood deck. Your fire feature will undoubtedly be the focal point in the space, but that doesn’t mean it should be an eyesore. We’ll work with what you have to create a completely new design that’s perfect for you. To preserve the integrity of your outdoor space, we will make sure that all areas surrounding the fireplace or fire pit are able to withstand the heat. If we need to add additional stones to protect the wood or landscaping, we will do so to protect you and your family. One of the best things about an outdoor fireplace or fire pit is that it can be used year round. 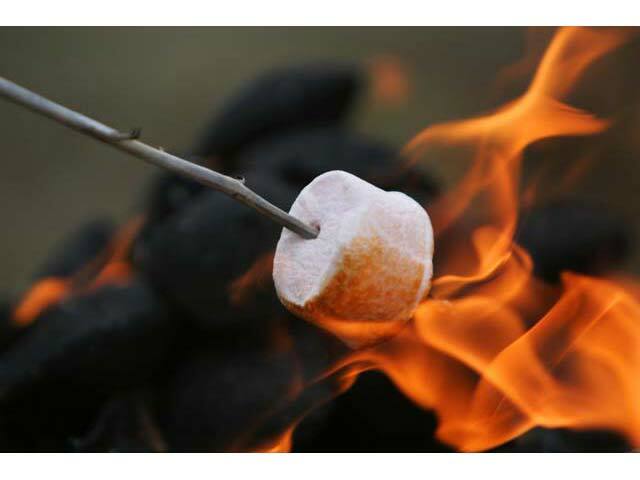 Your outside gatherings will be enhanced with marshmallow toasting, hot dog roasting, cocktails, warm cider and conversation! The benefits of capitalizing on the fire element’s appeal are many. An outdoor fire feature with year-round functionality extends the outdoor season and also extends your home’s spatial capacity for accommodating guests for outdoor entertaining and celebrations. Why should you have to stay inside when the weather turns cold? 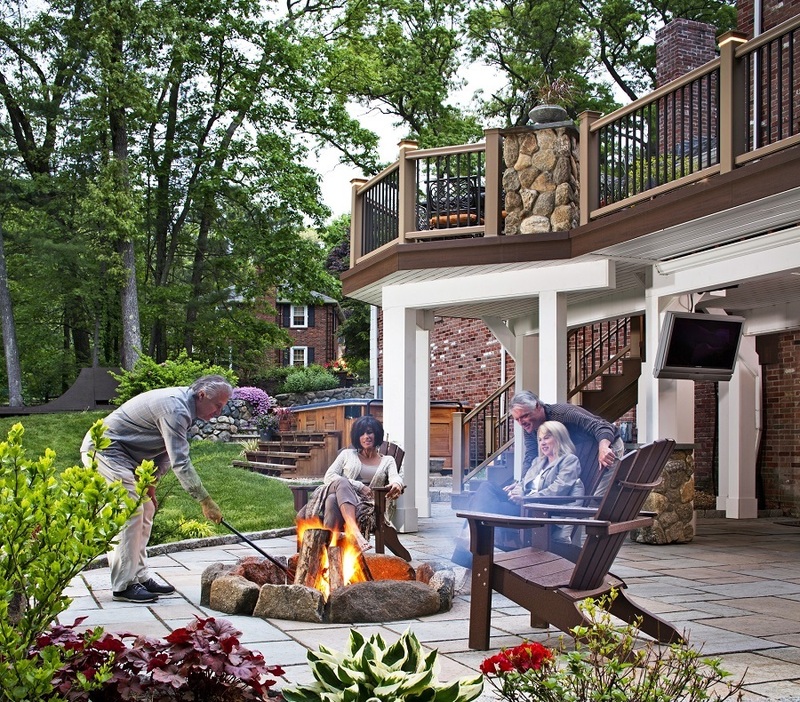 With an outdoor fireplace or fire pit, you can enjoy your yard throughout the year. Make the most of your outdoor entertainment options, or enjoy a peaceful night with your family. 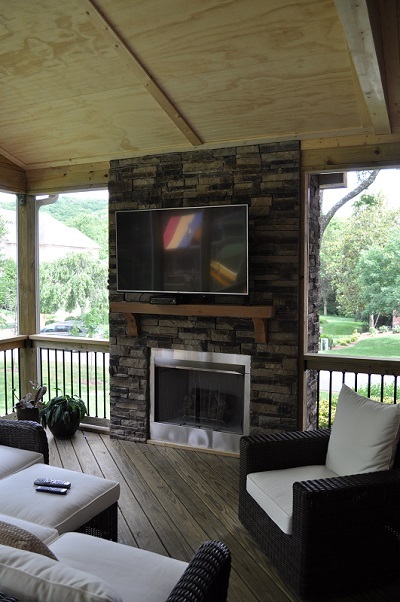 You can do all of this and more with a custom fire feature from Archadeck of Nashville. Contact us today to discover the outdoor bliss that awaits you. You can reach us by phone at 615-547-2333 or send us an email at [email protected] or fill out the form above and we will get in touch with you very shortly. Archadeck of Nashville proudly serves Arrington, Brentwood, Franklin, Gallatin, Hendersonville, La Vergne, Lebanon, Mount Juliet, Murfreesboro, Nashville, Nolensville, Smyrna, Spring Hill and Thompson’s Station, TN.